Opioid receptor is empty – As someone becomes tolerant to opioids, they become less sensitive and require more opioids to produce the same effect. Whenever there is an insufficient amount of opioid receptors activated, the patient feels discomfort. This happens in withdrawal. 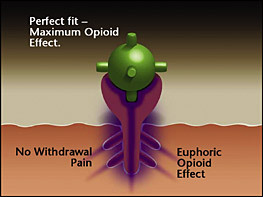 Opioid receptor satisfied with a full-agonist opioid. – The strong opioid effect of heroin and painkillers can cause euphoria and stop the withdrawal for a period of time (4-24 hours). The brain begins to crave opioids, sometimes to the point of an uncontrollable compulsion (addiction), and the cycle repeats and escalates. Opioids replaced and blocked by buprenorphine. – Buprenorphine competes with the full agonist opioids for the receptor. Since buprenorphine has a higher affinity (stronger binding ability) it expels existing opioids and blocks others from attaching. As a partial agonist, the buprenorphine has a limited opioid effect, enough to stop withdrawal but not enough to cause intense euphoria. Over time (24-72 hours) buprenorphine dissipates, – but still creates a limited opioid effect (enough to prevent withdrawal) and continues to block other opioids from attaching to the opioid receptors. ('bu-pre-'nôr-fen) (C29H41NO4) has been used in the US to treat pain and in Europe to treat both pain and opioid dependence for over 10 years. Buprenorphine is a semi-synthetic opioid with properties of a partial agonist, and partial antagonist. Even if the patient decides to take opioid drugs after taking Buprenorphine, he or she will not get high. Agonists are drugs that cause an opioid effect like heroin, OxyContin, and methadone. Antagonists are drugs that block and reverse the effects of agonist drugs. Narcan® is an antagonist and is used to reverse heroin overdoses. Another antagonist is Naltrexone, which blocks agonists drugs like heroin. The agonist property of the medication tricks the opioid receptors in the brain into thinking that they have received opioids without making the patient feel euphoric and reinforcing the addictive cycle. The antagonist property of the medication makes it virtually impossible for other opioids to attach to the opioid receptor sites. Therefore, even if the patient decides to take opioid drugs after taking Buprenorphine, he or she will not receive any additional effect. In addition to this blocking effect, Buprenorphine has a ceiling effect adding to its safety. Other opioids continue to provide more effect as more is taken, eventually leading to respiratory depression and death. Buprenorphine is different; its effects level off at a relatively low dose. That is, even if more is taken, there are no significant increased effects. Therefore, the risk of overdose is much lower than with other opioids. 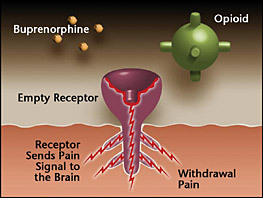 Opioids attach to receptors in the brain, with three main effects; reduced respiration, euphoria, decreased pain. The more opioids ingested the more of an effect. As a person increases their daily intake, the brain actually changes and produces more opioid receptors. This is why it takes more opioids for the same effect as the tolerance progresses. The process of opioids binding to the opioid receptors can be thought of as a mechanical union, the better the fit the more the opioid effect. Buprenorphine is different. It too binds to the receptors but with an imperfect fit. 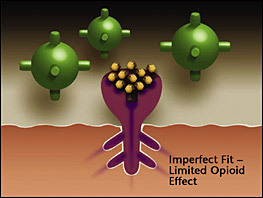 As a result the Buprenorphine tends to occupy the receptors without all of the opioid effects. 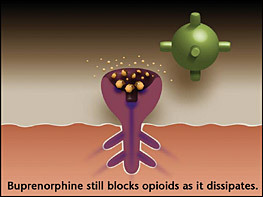 Buprenorphine tends to stay with the receptors, blocking them, much longer then other opioids do. This stickiness, is what makes Buprenorphine last so long, up to 3 days.